Victoria lost a superb musician, teacher and inspiration to many young and mature musicians with the passing of Gail O’Riordan at the Jubilee Hospital on September 16. She died of liver cancer surrounded by her family and friends but on her own terms and with the courage and humanity that she has displayed all her life. Gail was born in Victoria and completed schooling at Victoria High School in 1963 where she made many lifelong friends with her love of music and singing. She took a Degree in Music in Piano Performance at UBC between 1964 and 1968 where she met her future husband, Jon O’Riordan who impressed her with his swinging kilt and love for his native Scotland. She was an outstanding pianist performing with the University Orchestra and with chamber music groups. Following their marriage in 1969, Jon and Gail moved to Ottawa where Gail started a career as music teacher at Rockland School winning much support for her enthusiastic engagement with the students and her many musical concerts involving almost all the school population. They moved back to British Columbia in 1970 and Gail continued her successful teaching career in several schools in North and West Vancouver. But teaching became hard on her voice so she decided at the age of 25 to take up a career as a cellist, the sound of which moved her emotionally. She studied cello with Hans Seigrist the principal cellist with the Vancouver Symphony and even though starting late in life, her determination, discipline in practicing technique and wonderful sense of musical line quickly transformed her into a strong performer. Gail started her family late in life bearing a son Kevin in May 1989 at the age of 42. 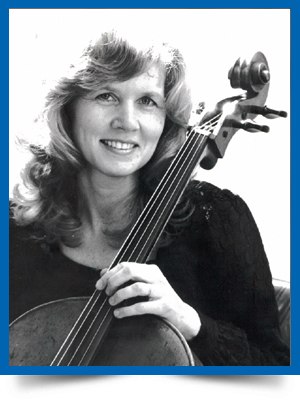 Though now being occupied as a mother, she started her next career as a cello teacher as she had unique abilities to inspire young musicians and to push their musical talents to each of their abilities. She developed a large studio producing many fine cellists some of whom went onto professional careers, but also many who simply came to love the cello, inspired by her enthusiasm and careful attention to musical detail. Her wonderful piano technique enabled her to accompany all her students with the full range of music from the simple to some of the most challenging music for both cello and piano in the repertoire. Gail continued to develop her wide range of musical talents as a singer and conductor. After returning to Victoria, she was a founding member of Amity Singers and a leading soprano for 12 years. Later in life she rekindled the conducting abilities she developed in her early career in 2016 when she directed the Upland Probus Singers in the semi annual social gatherings. Though many of the members had no musical training she thrilled them with learning how to sing vowels and work as ensembles. Both members and Gail had a wonderful empathy which led to many memorable performances for both singers and members. No obituary for Gail would be complete without reference to her core beliefs in progressive policies to improve the health of the planet, transform the role of corporations to commit to restore the Earth’s degraded ecosystems and reduce the inequality between the rich and poor. She was a firm believer in the evolution of human consciousness to embrace her vision of the planet becoming a safe and just place for humanity by mid Century. Gail is survived by her husband, Jon, son Kevin (Paola Camorlinga), sister, brother in law and nephew – Joanie ,Kim and Evan Hesketh (Farrah O’Shea), close extended family – Pia, Ralph and Allison Archibald (Kevin Klein), Inge and Werner Israel, and all of Jon’s family in the United Kingdom. A celebration of her wonderful, generous spirit and her musical contributions to the Greater Victoria community will be held at Uplands Golf Course on Monday October 8, 2018 at 3:00. Gail received wonderful care and attention at the BC Cancer Agency and would like any donations in her name to be given either to the Agency or to the Victoria Conservatory of Music. Her spirit, generosity and humanity will live in us forever. We will remember Gail for her warmth and beauty, inside and out. As a colleague I admired her musicianship as a cellist, pianist and educator as she nurtured and developed so many young cellists. Jon… you and Gail have shown incredible courage and spirit through her illness, and set quite the example of how to handle life’s crises. Take care of yourself. Our hearts and love go out to you all. Gail was a wonderful longtime friend whom we will miss immensely. Our deepest sympathies to all the family, including her extended family. We are all better for having known her and will miss her smile and laughter. Gail’s obit has come as a major shock. Even though we all go back to UBC days it was especially here in Victoria her contributions to music and the community really shone: her wonderful guidance to so many young cello students, her major support of the school strings programmes, and the Greater Victoria Performing Arts Festival. The Victoria Symphony will also miss her warm, musical, and beautiful presence. How sorry I was to hear of Gail’s passing. She and I shared many funny moments through the years in the Victoria Symphony and wherever else we were involved musically. She was beautiful and serene and quick to laugh and share a joke. I liked and admired her tremendously. Please accept my heartfelt condolences. When one met Gail anywhere in Victoria she always seemed to radiate joy, whether carrying her cello or boards to build a raised garden bed. Please accept my condolences and may wonderful memories of shared times help to ease your sorry through these difficult times. Gail radiated warmth and happiness. We valued her friendship and admired her leadership as Probus president where her smile and easy manner welcomed new and old members alike. We loved her conviviality and felt included in her life. Our deepest sympathies to you and your family. Oh my dear friend Gail. I got to know her when I was a student of Frona Colquhoun. Gail was the accompanist for most of the concerts in the 70’s. They were wonderful times. Once I had a rehearsal with her at their house in Victoria. I remember her coming into the room bearing one HUGE strawberry, and she gave it to her husband in the kitchen. They laughed and laughed cause it was the only strawberry in the patch. Her laughter was incredible. So talented. So gifted. And I loved her up do’s. Her sausage curls, when I was a kid, were the envy of all. She played a “mean” piano and an even “meaner’ cello….she played with passion and life. And she took her coffee ” well polluted”…..as she once said to Frona Colquhoun, during a rehearsal….will miss you, Gail. Much love. Gail was a lovely person, both inside and out in so many ways. She was a great teacher and her connection to her students and her ability to bring out the best in them was impressive. I have fond memories of listening to students in your living room, accompanied by Gail on the grand piano, as they prepared for concerts or festivals. Our condolences to your family at this sad time. Gail touched my life and I am so grateful for her spirit of dedication to music. She was and will continue to be an inspiration for many. Her actions and words were always so kind and generous. Her passion for music was infectious and I know will continue to inspire all of us who were fortunate to have known her. Much love to her family at this time. On behalf of the Ngai family, we offer our condolences and well wishes for her family. Gail accompanied me and my brother in many violin concerts and group lessons when we growing up as violin students of Frona Colquhoun. She is in all the pictures. I especially remember her warm laughter ~ Maxwell, Emlyn, Esther, James. You and Gail have been a great support and friend to me and my family throughout my years in Victoria. I will always cherish your roles in our lives, both professionally and personally. Our thoughts and prayers are with you. Gail was a wonderful friend and I’ll miss her. We know what a great light has gone from the center of your world. Gail touched the heart of everyone who was lucky enough to be in her glowing presence. We are so glad she was able to bring her joy and enthusiasm in life to Jordan and Nerea’s special day last summer. We are so pleased too, that you had that chance to all travel as a family. We treasure that memory. Gail was a lovely soul that will be missed, she brought much joy to those around her. Her spirit brought much to our shared travels through Botswana, Cape Town and India. Her passing is a sad one indeed. I remember Gail for the sunshine and generosity in her eyes. I am so grateful for her kindness, sensitivity and devotion to a more beautiful world. All my best to Kevin, Jon and family. Gail brought joy and love to all. Generous and a gifted musician, she inspired her young students. I have fond memories of Gail when she was little, always smiling and laughing. Although we only knew Gail for a few years, we are greatly saddened by her loss. Whether hiking in the woods, over a glass of wine or around the dinner table, she was always ready to share her views of the world, to listen to others, and to work to make it a better place. Our sincere sympathies. Dear Jon, Kevin, Joan, Kim & Evan, I am so sorry for your great loss. Gail was a warm, generous and intelligent woman and I feel lucky to have entered into her sphere on numerous occasions over the years. Her spark lives on in all of you. Much love….. I have many happy memories of Gail, especially the year she and Jon spent in England when they lived quite near us and we got to know Gail much better. She even introduced us to Mexican food which was fairly unknown in U.K. then. By a strange coincidence two members of the Aeolian string quartet were neighbours of ours. During that time Gail studied with Derek Simpson and Jon with Margaret Major so we often saw them- Gail with her cello on her back. It really was an amazing achievement to take up and become so accomplished on the cello at a relatively late stage. It was a real pleasure knowing Gail, she was always interesting to speak with and gave you her undivided attention when conversing, and this really made you feel special. I remember one family dinner at Glencairn Crescent and Gail suddenly started singing “3 Craws sat upon a wall” I was impressed she knew all the words, especially since it is in broad Scots. It’s funny what memories stay with you. What a wonderful human to have in one’s life! She inspired me in so many ways that transcended her cello lessons. Her joie de vivre was so contagious, I can still hear her wonderful laughter and see her smile. I remember our conversations, much about the two of you and how proud she always was, and about all your shared worldly adventures. I am forever grateful to her, for she was incredibly generous to me sharing her musicianship gift, letting me play her beautiful cello. She inspired my own teaching practice. Her lesson, “don’t rush to get fast” will stay with me. Gail became a great friend and I will miss her. My thoughts are with you. Gail’s spirit and musicality added so much to our lives and will always be an inspiration. Her laugh was contagious and I believe I will continue to hear that wonderful sound when I think of her as well as remember her enormous support of her students and the students who continued on at UVic. You have all been so gracious and an amazing example to us in so many ways. To all the family and friends of Gail. So sorry to have missed being at Gail’s side as part of brotherly love. Best wishes for the memory of Gail’s life on Monday. Gail had a very great interest in fighting the powers that wanted to force further fossil fuel transport through indigenous peoples’ lands. It is to be hoped that her intense interest in this mission will lead to a permanent low carbon energy future for all Canadians. Gail was an inspiration to me and my children. We were missing her and sending our positive thoughts her way and we’re devastated by her passing. She was kind and patient. We will all miss the joy she brought to her concerts, how you could feel her love of the cello community she created with her students and the pride in their hard work. Aleks, Gabe and Krisz are so sad that she is gone. Krisz is so sad that he will never bring her another bouquet of flowers at the end of a concert or recital. We will all miss her. We have lost a bright spot in our lives, but are better for having had her in our lives at all. Jon and I were in Totem Park at UBC as graduate students in the UBC Geography Department when Jon spied this gorgeous young Canadian girl across in the adjacent Totem Park Tower. Being with Gail on her last day was very special as it seemed the outer beauty and joy that everyone has referred to was infused with a spiritual glow. She was more beautiful than ever. Her inner joy and outer effervescence and fun were simply luminous. It was very moving and a time we will never forget. In these last months it has been a privilege and honour to see Gail and Jon express their love to each other in such special ways. We learned a lot and were so honoured to be with them both in this last phase of their journey together. Words don’t seem very adequate. We could not be at the celebration of Gail’s life but to us her life was simply her personal symphony of joy – the strains of which will inger beautifully in our hearts. Gail was a bright light and I will remember her encouraging generosity, kind smile, and the lovely sound of her voice. To say the least, fond memories. I am just now reading this, shocked! I’ve been out of touch since moving to the mainland 10 years ago, but I remember Gail well, and how impressed I was at her work as a pianist, and the fact that she took up cello, successfully, at an age where most people wouldn’t dare. I enjoyed playing many quartets with her….such a lovely person in every way! She glowed! I am so sorry.